Okay, I know I have another month before spring is here, but I’ve already got the bug. It was starting to feel all wintry and gray and dreary in here, and I know I was tired of looking at myself in the banner image. So out with the old and in with the new; now I’m feeling all clean and shiny. It occurred to me that a new button would be in order as well. I’ve been making lots of buttons, but haven’t done one for myself in a long time. My old ones are still available on my buttons page. This is an original layout, hand coded by me. The fabulous tomato photos are from here; thanks for the link, Kim! I created the sidebar dividers from scratch in Photoshop. 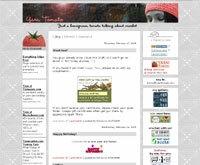 The tomato on my blog button was also drawn by me in Photoshop. 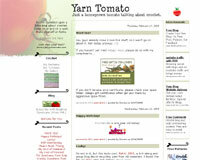 It’s the same one that’s in my favicon, for those of you who have seen my little tomato in Bloglines. I love the new layout and look. You did an amazing job! I LOVE IT!!! it DOES look great! i think the bug has hit many of us.. lol .. just look at me.. i dont really like change but freshened mine too ! Like the new look! I suppose I could update my blog’s look, but that would take time away from reading other blogs. haha! I thought of you yesterday–I was in Annapolis and this shop had little personalized crab keychains, but no “Donna”! bummer. I’ll keep looking. Looks great! I’ve been meaning to update my look too for a while. I *will* get to it though. Really, your blog looks AWESOME! Very nice and fresh! I like it!! !